Presentation: Regular Papers classified as Full Papers are awarded a 30’ minutes slot for an oral presentation at the conference. 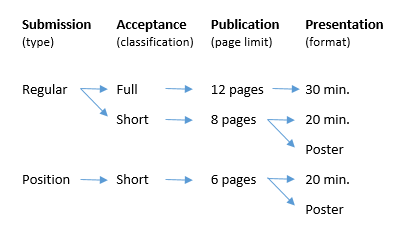 Regular Papers classified as Short Papers are given either a 20’ minutes slot for an oral presentation or assigned to present at a Poster Session. Authors which have been suggested for an oral presentation, either Full or Short, may however also choose to present at a Poster Session instead, should they prefer it. Presentation: Position Papers are given either a 20’ minutes slot for an oral presentation or assigned to present at a Poster Session. Authors which have been suggested for an oral presentation may however also choose to present at a Poster Session instead, should they prefer it.